​After all the hark-backs to April 27th, 2014, all the raucous chanting about Steven Gerrard slipping on his 'f#@&ing arse', all the aptness of Brendan Rodgers losing out to a more pragmatic manager on Friday night, Chelsea fans forgot one thing on Sunday afternoon: Chelsea aren't Chelsea anymore. Or, if you're going off this season alone, Chelsea are still, painfully, very much Chelsea. I know, it's confusing. Any semblance of the defiance that dominated the Jose Mourinho eras has gone (replaced with...what? ), but the problem isn't just that nothing remains from those heady years, it's that, somehow, so many things do. All season, this team has had the look of a side rife for Mourinho, or even Antonio Conte, to ripen. The problem is the use-by date for that exercise was two years ago, as the Italian found out. If you exclude Callum Hudson-Odoi (which Maurizio Sarri had done for most of the season until he handed in a transfer request), the mean age of Chelsea's frontline comes to 30 years old, with change. Liverpool's comes to 26, with some far more appealing change. Going into Sunday's game, fans clung onto that most ​famous of days in 2014, citing the slip and the result as hope for what could happen this time out. But what we should've heeded from that game was the three remaining players from that fateful day, and the story their trajectories since tell and, ultimately, told on Sunday. The three players are, of course, Cesar Azpilicueta, Willian and Mohamed Salah. And all three had moments on Sunday that seemed to encapsulate this interim period, as well as the status of the west London football club for this season and beyond. First of all, a disclaimer: I don't actually think ​Chelsea were that bad on Sunday. But then, that's kind of the point, isn't it? The other away days against 'top six' sides this season have been so stark, that some desire, skill and potential potency was nice to see. The problem was the potentiality of that potency, because that has been the state of Chelsea's attack all season. They threaten to threaten, then flatter to deceive all over again. 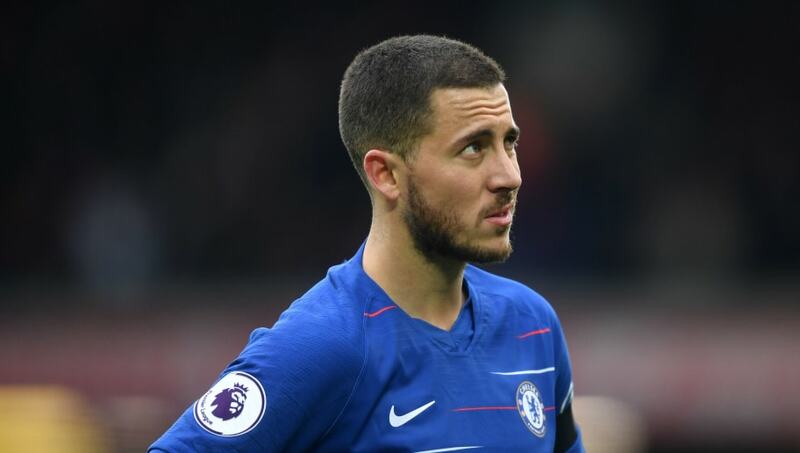 The chances come, the chances are missed, the desperation sinks in, the pressure mounts on ​Eden Hazard, he either delivers or he doesn't and the result is set accordingly. Against the Reds, he delivered everything but a goal, yet it was no wonder; aside from Ruben Loftus-Cheek, who showed once more why Ross Barkley shouldn't be a thing, there was no one for the Belgian to play off. Not even Willian. The scorer of the sealing goal in 2014 has been a faithful servant at Stamford Bridge, and a far better Blue than some give him credit for, but he is 30 years old now. He has never been a prolific goalscorer, and has always had an air of the ethereal about him. Put simply, he never looked like scoring. Never. You know who not only looked like it, but did, and emphatically so? Mo Salah. The Egyptian scored with an absolute thunderbolt of a strike, sprinkling the final specks of dirt salt-bae style in the faces of those disgraceful morons who thought racist chanting would be a nice way to warm up for a Europa League quarter-final; a player who they would've been cheering to glory had the club possessed the foresight to not discard talent so prematurely and so frequently in that period. Salah played just 19 games for Chelsea - that's £500k a pop - but the lessons the club learned from the unnecessary ridding of players like Kevin De Bruyne, Salah, Juan Cuadrado etc. have been the wrong ones. Instead of providing further time and support for youngsters, they've given it to the veterans. They've stockpiled the once-successful 31-year-olds, offering them a nice retirement package and a house by the river to see out their footballing days, free of trophies, but free of worry, too. Azpilicueta should not be considered part of this nursing home, he is so, so much better than that, but he is also no longer the best defender in the Premier League, and has been asked to play twice as well as that to combat his fellow defenders' shortcomings, all while adjusting back to a role he'd lost touch with. He was also guilty of providing a painful snapshot of what life post-Hazard could be like; while the improbable fight for a comeback was still on, there came a moment where, for once, two players were unmarked on the edge of the six-yard box, waiting with baited breath for an accurate cut-back from the flanks. The Spaniard, panting, was over the ball down the wing, but instead of taking the time to look up - whereupon he would've seen the ball that was on - he just thrashed it across the face of the goal to absolutely no one. This is a man who has given absolutely everything for this club, and should be receiving the kind of cover and licence that was afforded to Branislav Ivanovic during his latter stages. Instead, he's reduced to being cast as a past-his-prime scapegoat. I'm still just about 'Sarri-in', because it feels like there are no viable alternatives willing to come in, and it's still too early to play the Frank Lampard card, but something needs to change. That something has to start with a pandering to youth within the club, and a patience with it on the terraces. Whether that's too much to ask remains to be seen, but this is Chelsea we're talking about - past and present, they've been terrible at both.